Rantings of a woman bound to make history. One of Honey's first records was an instrumental recording of a song called Wheels. He played it a lot. A LOT! Like over and over and over again a lot! Until his brother came into the room and broke the record. But because of the trauma of the destruction of this record, Honey has been fascinated with wheels. Cars ... tractors ... trucks ... wheels. And 2011 has been named at the Lafrenz household, the Year of the Wheel. Maybe that should be the Year of the Wheelbarrow! Truth in blogging ......... I know we have a bumper sticker on the back of the truck that says "We brake for Steel Wheels". It has got to be there! Under the gravel dust! Cuz that's how we roll! A lot! We were driving to our favorite lumber yard and suddenly, we see a garage sale with garden stuff! 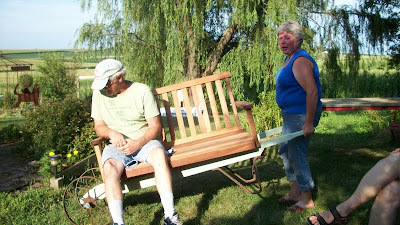 And for a whoppin' $5, we pick up a steel wheelbarrow with a steel wheel. The problem is ......... these babies are heavy when they are full of mulch or even weeds!!!! So what to do??? What to do??? The PERFECT fire pit for Miss Eff's! Ahhh........ the beauty of it! But the next project was a solution to a problem. We need lots of seating at Miss Eff's! And we need it in lots of places! Sometimes, that means getting a bench from here to there! And occasionally, that means doing it by myself. 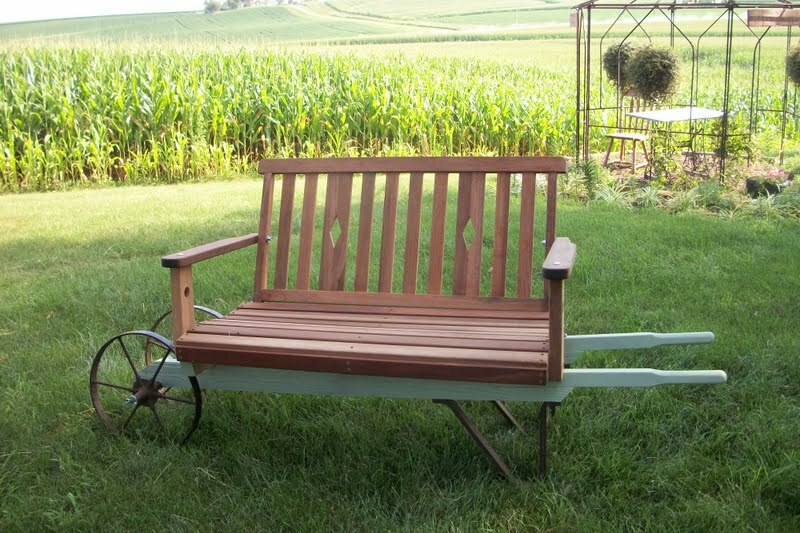 This is the prototype of the Wheelbarrow bench. We still have some tweaking to do! Well, not we ......... Honey has tweaking to do! But it is very very close. And this is perfectly usable for what we want. Honey needs to tweak stylin' a bit! This is NOT how tweaking is done! So creative! I love them both. You are absolutely correct that "This is NOT how tweaking is done!" Cliff really needs another babe to also shade his head -- something like a palm branch -- while you push. Ahhhh . . . a Miss Daisy moment! SMASHING ! Nothing like the craetive minds of youth and you are one youthfully creative gal. So glad I found your blog! 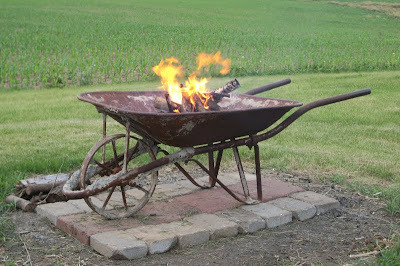 Can you tell me if you had to do anything special to the wheel barrel to make a firepit? Val -- not really. It is a steel wheelbarrow. Very heavy ... and it had a little rust on it. We put a small metal rack in it but that was it. 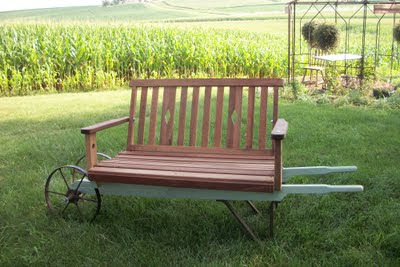 I wonder, would a regular wheelbarrow with wooden arms and an old flat tire work for a fire pit? Probably not... that *would* be my luck since I have one lying around with no purpose. (I thought of making it into a flower bed, but I would like so much more to have a cute, unique fire pit.) Thanks! A wonderful idea for a fire pit and garden bench.